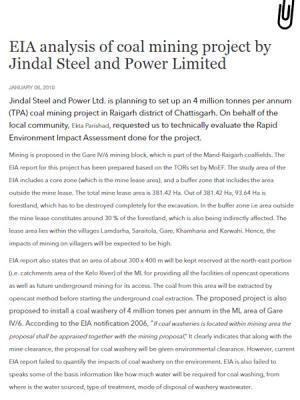 Jindal Steel and Power Ltd. is planning to set up an 4 million tonnes per annum (TPA) coal mining project in Raigarh district of Chattisgarh. On behalf of the local community, Ekta Parishad, requested us to technically evaluate the Rapid Environment Impact Assessment done for the project. Mining is proposed in the Gare IV/6 mining block, which is part of the Mand-Raigarh coalfields. The EIA report for this project has been prepared based on the TORs set by MoEF. The study area of the EIA includes a core zone (which is the mine lease area), and a buffer zone that includes the area outside the mine lease. The total mine lease area is 381.42 Ha. Out of 381.42 Ha, 93.64 Ha is forestland, which has to be destroyed completely for the excavation. In the buffer zone i.e area outside the mine lease constitutes around 30 % of the forestland, which is also being indirectly affected. The lease area lies within the villages Lamdarha, Saraitola, Gare, Khamharia and Karwahi. Hence, the impacts of mining on villagers will be expected to be high. EIA report also states that an area of about 300 x 400 m will be kept reserved at the north-east portion (i.e. catchments area of the Kelo River) of the ML for providing all the facilities of opencast operations as well as future underground mining for its access. The coal from this area will be extracted by opencast method before starting the underground coal extraction. The proposed project is also proposed to install a coal washery of 4 million tones per annum in the ML area of Gare IV/6. According to the EIA notification 2006, “If coal washeries is located within mining area the proposal shall be appraised together with the mining proposal,” It clearly indicates that along with the mine clearance, the proposal for coal washery will be given environmental clearance. However, current EIA report failed to quantify the impacts of coal washery on the environment. EIA is also failed to speaks some of the basis information like how much water will be required for coal washing, from where is the water sourced, type of treatment, mode of disposal of washery wastewater. Location: The area surrounding the project site is rich in coal. Many sub blocks of the Gare block (for instance Gare IV/1-Gare IV/7, Gare IV/8 etc) are either operating or in the process of being leased out for mining. Also, industries based on coal have also come up. The 4x250 MW OP Jindal Super Thermal Power Plant, 2 X 150 MW middling and coal fine-based thermal power plant (construction started) are an example. Cumulative impact on environment not assessed: Considering the location of the project and others industries, it is clear that the environmental impact will be cumulative. The EIA report has addressed project-specific issues but failed to quantify the combined impact of industries on the region. Such overall impact on air quality, total loss of forest and its ecology, impact on ground water, silation of river due coal mining etc. Hence, water availability in the entire region will become a serious issue in the future. Within 0 to 10 km a number of industries with high dust generating potential are operating or are likely to operate in future, hence the cumulative impact would be far higher. The 10 km radius is ecologically sensitive and industrialized. In addition to 4 x 250 MW, OP Jindal super thermal power plant there are numbers of coal mines are in operation such M/s. Jayaswals Neco Ltd, Gare IV/1 open cast coal mine with a washery), Gare IV/5 underground mine of Monnet, and few of them are in pipeline for environmental clearance such as Gare IV/2 and IV/3 open cast coal mine, Gare IV/4 open cast coal mine, Jamkhani coal block of Bhusahn ltd, Bijahan coal block, Bhushan ltd and others. All these projects have direct or indirect impacts on the forest, agricultural land and human habitation, for instance M/s. Jayaswals Neco Ltd mine lease has diverted 46 % of forest land (224.22 ha), this project (Glare IV/6) will destroy 92 ha of forestland completely. Each mining EIA talks about the project specific issues and failed to describe the total diversion of forest area and impact on forest animals. The prepared EIA of Gare IV/6, also failed to provide in adequate information and poor in assessing the impacts on forest and its ecology. While assessing the biodiversity impact, the EIA developer has just listed down the presence of flora and fauna in an area, Inspite of the fact that existing forests have scheduled-1 and seduled-2 listed animals such as bear, leopard, fox, Bandar, pea fowl etc The EIA report has failed to quantify the cumulative impacts on forest. This has been done to justify that the selected area can support the upcoming project. EIA report is also incomplete in providing information on the existing industries and proposed industrial establishment (see table 1). It clearly shows that area is heavily stressed and likely to be more stressed in future once the entire project starts it operation. EIA has listed only few industries like Monnet Ispat UG coal mine, Gare IV/1 coal mine, Gare IV/2 & Gare IV/3 coal mine, Tamnar 1000 MW thermal power plant. Land use pattern: The project requires 381.42 hectares of land (page 1-1). The area inside the proposed mine lease is a forestland which is around 93.64 Ha (24.34 % of the total land), which has to be destroyed completely for the excavation. EIA states that it is unclassified forest, however in the fig no 3.7, it is marked as protected forest (PF). Besides forestland, the core zone (mine lease) is predominantly covered by the agricultural land, which accounts 67.37 % (page 3-17), which is also completely destroyed for mining. In short, around 67.37 % agricultural land and 30-31 % forest are to be destroyed by the proposed mining. In the buffer zone (consisting of area within a 10-km radius of the proposed site), 30 per cent of the total area is under forests (page 3-17). According to satellite imagery, this figure is approximately 31.13 per cent (page 3-19). In any case, all the available data goes on to show that the region is heavily forested which is also being indirectly affected. Top soil - Information on topsoil is contradicting, in page (2-19, overburden removal: truck and shovel), mentioned information on the thickness of the top soil is 1 meter, and total quantity of top soil generation is around 1.83 million m3. However, in page (5-3, Top soil management), thickness of topsoil is given 0.5 m and topsoil quantity to be generated around 2.1 million m3. However according to CSE estimate, if 0.5 meter thickness of topsoil is considered, then total soil quantity to be generated around 1.91 million m3, if 1 meter thickness is considered then topsoil quantity will be around 3.8 million m3. Moreover, topsoil storage yard of 4.5 ha is located at the southern bank of the Kelo river which is a flood plain, hence inspite of sound mitigation there would be high risk of soil loss due to water erosion. The proposed mining operations in the Gare-IV/6 block will commence from the northeastern portion of the lease area (pp 2-19), The general land slope of eastern part of the block is towards SE i.e. towards Kelo River and mine lease is the part of the catchment’s area of the Kelo river, hence river siltation will be the biggest threat that can be anticipated. Moreover, siltation risk on the Kelo River will be also high due to active and proposed coalmines in the area. The EIA report has completely silent on river silation and impact of loss of drainage system. The Kelo River drains into Mand River and ultimately to Mahanadi. The EIA report has completely failed to address the issue of increase in siltation in the Kelo river and Mahanadi (where kelo river drains) on which Hirakund dam is constructed which is around 50 km from the project. Reduction in the river flow can also be anticipated due to increase in depth of open cast mine and reduction in the catchments areas by mining industry. The EIA states that backfilling will be start from the 3 year of the project and excavated material will be stored in the open, heavy runoff will cause high risk to river. According to the EIA report, open cast coal mining by proposed mine will involve breaching of the groundwater table. The depth of the groundwater table varies between 2.81 to 10.6 m below the ground level during the pre-monsoon period, and in post monsoon it ranges between 0.5 to 4.05 meter (page 3-14). The final quarry depth during open cast mining is around 95 meter. It is therefore obvious that the mining project will cause large-scale breaching of the groundwater table. The hydrological study (done for Gare IV/2) indicated that ground water flow is towards the Kelo river (page 4-3), hence it also obvious that due to this proposed mine and other mining operation will decrease the flow in the kelo river. The report is completely silent on the industrial stress on Kelo river – already receives substantial water from discharges from the adjoining mines. The EIA report is also silent on the loss of Kelo river catchments areas for industrial siting or for mining. The EIA report failed to provide information on the mine seepage, similar coal mine of Jindal (Jindal’s coal mine, Gare IV/1) alone, in a single day, the average groundwater seepage from the mine is 11,200 m3/day, which is equivalent to water requirement of 89,600 people (assuming 125 litre/day/person is the water demand). However, EIA report of Gare IV/6 is completely silent on mine seepage. Also we know that once all the proposed mines began to operate, impact on ground water expected to be very high or combined impact of all mines on the region will alter the regional water balance, river flows and impact agriculture and forest due to vast seepage of underground water. The EIA report has completely missed out on addressing the issue of cumulative impact on the regional water balance. The EIA report has done an analysis of the impact on local groundwater resources by doing a groundwater balance; the total groundwater balance is not clear as the details of how the groundwater balance was done are not provided in the EIA report. Moreover, the water consumption considered in the calculation seems wrong, in the calculation 65 m3/day is used as water consumption (see page 4-4), however, in page 2-36, water consumption in mine is 446 m3/day which is either mine seepage or bore well water. However, while assessing the impact on groundwater resources in the study area, the cumulative impact of water consumption by various industrial sources has not been taken into account (such as water consumption by existing coal mines and washery, 150 proposed Jindal power plant, proposed water demand for coal washery in Gare IV/6 etc). Further, a coal bed methane extraction project is also in pipeline in area, which extract huge quantity of groundwater. The groundwater balance has also not calculated groundwater utilisation by others users – for instance groundwater consumption by cattle, water utilisation in forest areas, water discharged into surrounding mine pits, and groundwater losses. Also, there is no information on whether recharge has been calculated taking into account recharge through water spread areas, recharge through irrigated areas, and recharge through water discharged from surrounding mine pits. Such a detailed analysis is required in a heavily mined area, without which a correct analysis cannot be done. All the rivers in the region (the Kelo, Mand and Kurkut rivers), which are important sources of water in the region, are already heavily stressed. The upcoming industries in the district (and there are a considerable number, since Raigarh is an emerging industrial hub) are increasingly depending on groundwater. As a consequence the region is beginning to face a groundwater crisis. In fact, when Jindal Power Ltd. asked for permission to dig 40 tubewells for its Super Thermal Power Plant, the Groundwater Survey Department recommended against giving this permission – stating the possible adverse impacts on the local groundwater regime (ref: letter dated 15/04/2006). Furher, 2 X 150 MW middling and coal fine-based thermal power plant is 100 % depend on mine seepage from Gare IV/1 and borewell for its operation. Mining activity can be hugely air polluting, given the vast quantities of material handled. This is specially so if the project under consideration is proposed to come up in a heavily mined area, as is the case under consideration. Assessing the impact of air pollutants is therefore very important. In particular, suspended particulates have to be estimated, and their impact assessed. Fugitive emissions: Regulations governing air pollution concentrate on point source emissions – however, emissions from non-point sources, i.e emissions during material storage, transportation and handling are equally important to monitor and control. In fact, often, fugitive emissions are more harmful than particulate emissions, because of the sheer magnitude of the emissions. According to the EIA report, approximately 7 million m3 of overburden and topsoil will be stored in the open and it will remain stacked for two years because EIA states that backfilling will commence from the third year, Therefore there would high risk of fugitive emission and storage yards further aggravate the river siltation through run off during rainy season as area receives high rainfall. EIA also states that when the mine is fully developed, annual material handling (coal & overburden, average OB: Coal ratio is 2.338: 1) will be around 4 million tones of coal and overburden 9.4 million m3 of overburden and increase – high risk of fugitive dust. According to the EIA report, mined coal will first washed in the washery and transported (by road) to the DRI plants of JSPL and NSIL located in Raigarh at an aerial distance of about 50 km and 40 km repectively. Moreover EIA also states that flyash will be use for backfilling the excavated area; hence it will further increase the pressure on road. However EIA failed to quantify the impacts of increase in traffic density on road and associated pollution. It is anticipated that impact of transportation on environment (both gaseous and fugitive dust) will be far high once the entire mines starts its operation. As the area is ecologically sensitive and most of the study area (core & buffer zone) is under forest (more than 60 %), hence assessment of biodiversity is a crucial area for detailed assessment but EIA report is a poor in portraying the ground reality or assessing the biodiversity. For biodiversity assessment, EIA developer has listed down the flora and fauna names in the study area and also indicated the dominant species. The EIA report states that the forest, which is in mine lease, does not have schedule-1 animals but adjoining forest just outside the lease (i.e. buffer area) have schedule animals like leopard and bear. It is misleading statement. However, the biggest weakness noticed in the EIA in terms of evaluating the impact of the project on local biodiversity is that no attempt has been made to do a cumulative impact analysis of the various industrial activities. The ecologically-rich study area is now facing the brunt of not just this proposed project, but also of other large projects in the area – including the 4x250 MW Super Thermal Power Plant. The region surrounding the proposed plant is also rich in mahua plantations, which is of very high economic value to the local community. There are allegations (recorded in a case submitted to the National Appellate Authority, which is reviewing the environmental clearance given to the 2nd stage of JSPL’s existing steel plant) that emissions from JSPL’s existing steel plant in Raigarh have caused a reduction in the yields of mahua crop in the surrounding areas. It is therefore important to conduct a thorough study of the exact impact of various pollutants on mahua as well as other vegetation in the forests in the region. No such analysis is available in the EIA report. EIA report claimed that “ No negative impact on forest, flora and fauna is anticipated in buffer zone, page 4-9” but failed to give justification to sustain its claim. How could any EIA report without strong evidence can says that no impacts on biodiversity as more than 90 Ha of land is completely destroyed for mining or presence of reserve forest at a distance of 1 km from the mine lease. EIA report also states that 5 meter embankment will be constructed on the bank of Kelo river to prevent floodwater entering the mine. But EIA report failed to provide much information such type of wall, time frame for construction.